Ever thought that Michelle Obama's strong, sculpted arms could come in handy while cranking out push ups in boot camp or holding your plank in yoga? Us too. It turns out that getting guns like MObama just takes the right kind of moves — and, hallelujah, they don't include endless bicep curls. "For nice, muscular arms all over, you actually want moves that will get multiple parts of your body involved, which will help boost muscle, shed fat and increase calorie burn," says Naeemah Brown, fitness manager and trainer at the Reebok Sports Club New York. She created this super easy arm toning workout exclusively for Bustle. 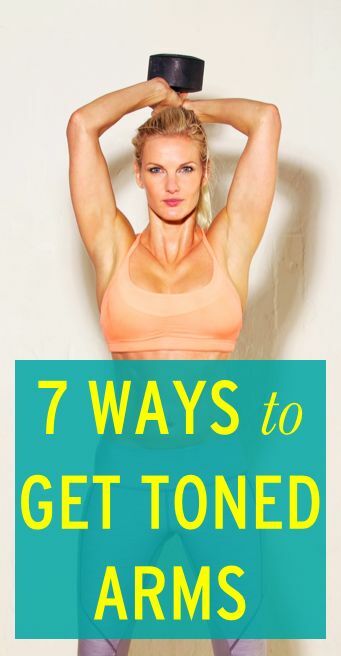 Add these moves to your workout regimen, and you'll have an envy-worthy upper body in no time. Grab a pair of two to five pound dumbbells. With one weight in each hand, raise hands to the height of your jaw, one on each side of the face. Hold your elbows close to your sides. Set a stopwatch at 60 seconds and begin throwing constant alternating punches in front of you. "You'll want to get a full range of motion without overextending, so be careful not to lock out at the elbow joint," says Brown. Rest for 30 seconds and do another round. Get into a plank position with your forearms on the floor. Elbow should be directly in line with your shoulder joints. Keeping your hips parallel to the floor and without shifting your weight, lift one arm off of the floor, place that palm directly under the shoulder on that side, and straighten the arm by pressing the palm into the floor. Follow with the other arm so you end up in push up position. Drop the first arm back down to the starting position, then the second. Alternate the starting arm and do eight reps with each starting arm. You heard right. This grade school favorite will not only amp up your heart rate, it's a great move for shoulders. "To get your arms involved, extend them further for larger circles," says Brown. Do two 60-second rounds, with 30 seconds of rest in between. With the feet hip-width apart, bend the knees and squat parallel to the floor. Reach the hands down toward the floor in front of you and walk them out to a plank position. Then drop down into a push up. Walk the hands back up after the push up and return to the squatting position, then the standing position. Repeat 10 times. Stand with your knees bent, leaning slightly forward with a straight back, arms at your sides. Hold a dumbbell in each hand. Raise one elbow behind you so that the upper arm is parallel to the floor, then extend the forearm back until the entire arm is straight behind you, rotating the palm so that it is facing the ceiling. Bring the forearm forward again. Do 10 to 12 reps with a challenging weight, then switch arms and repeat. "You can also use a resistance band with this exercise, for the same results," says Brown. Simply stand on a band with one end in each hand, feet shoulder width apart. Raise one elbow behind you so that the upper arm is parallel to the floor, then extend the arm fully behind you, still holding one end of the band in each hand. Bring the forearm forward again. Complete the same sequence as with the dumbbell. Stand on a resistance band with one end in each hand, feet shoulder width apart. Keeping the chest up, bend knees into a quarter squat to start. Still holding the band, press one hand up above head, arm fully extended. Then, rotate the arm across the body to the opposite side, down across legs and back up, ending with the arm straight overhead. That's one rep. Return to start, with both arms down and repeat on the other arm. Do a total of 12 rotations. Hold a dumbbell in each hand and stand hip width apart. Raise left arm in front of you, holding the weight vertically. At the same time, raise the right arm out to your right with the palm facing down, weight horizontal. Return to your start position. Do 20 reps, alternating arms for each rep.